GEIST has been forging a new World Music style since 1987. 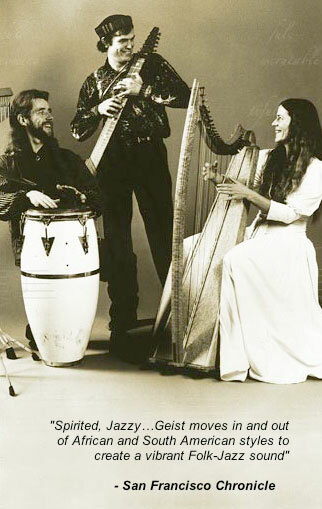 With Diana Stork on Neo-Celtic and Latin Harps, Teed Rockwell on Touch-style Fretboard/Chapman Stick and Mika Scott, on Percussion, the members of Geist combine world rhythms, melodies and the sound of natural strings in their own unique and exciting style. Their original compositions, often rooted in the folk traditions of world cultures, spin off from the familiar, creating an exciting new synthesis of sound. The music of Geist reawakens its listeners, transporting them through the bustling marketplaces of downtown New Delhi, to the slow stretches of the African plain, from the provocative syncopated dance rhythms of Venezuela to the haunting sweep of new sounds. This is music that penetrates to the core. Its captivating beauty and infectious energy can’t help but rub off. Witness Geist’s audiences: sometimes dancing freely and expressively, other times swaying, eyes closed, off on a journey. Even at first hearing, there is something hauntingly familiar about the music of Geist—yet it is refreshingly new in its scope. Geist has performed extensively throughout the Bay Area—in concert halls such as Grace Cathedral, Yerba Buena Gardens, Mountain View Performing Arts Center, as well as touring Italy and Germany. They’ve played at Festivals in the US and Europe such as Mill Valley Film Festival, Bremenale, Marin Mountain Play, Health and Harmony Festival, Russian River Jazz Festival, Whole Life Expo, Festival of Harps, Haight Street Fair, etc. They’ve also collaborated with a number of well-known teachers and healers such as Dr. Charles Tart, Dr. Meir Schneider and Dr. Marc Lehrer.